Compatible with: Apple iPad Pro 10.5 inch, Model number(on iPad back cover) is A1701 or A1709. - Texterior is made from PU leather, and the interior is lined with non-scratch microfibre material so you don't need to worry about any damages. - The case works as as a stand and can be positioned in many different angles,either at a low angle to aid typing or to support the tablet at a steeper angle more suitable for photo slide shows / movie viewing. 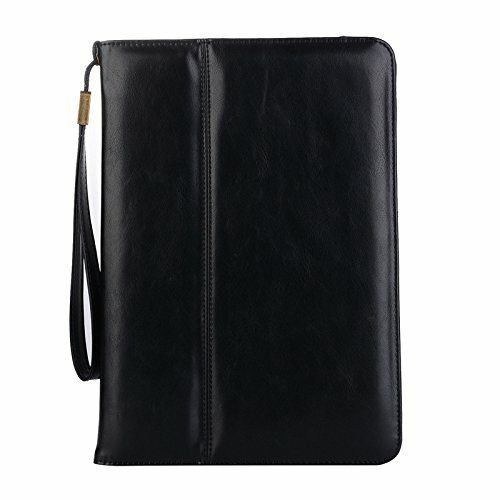 - There is also a wallet pouch designed in case,where you can conveniently store your documents or other paperwork. - Magnetic strip built inside that instantly wakes up iPad when opened, and makes it go to sleep once you close. Designed specifically for iPad Pro 10.5 inch (model No. A1701 or A1709), please confirm your iPad model before order it. Cut outs are accurate for easy access to all ports, buttons and sensors.Protects your tablet from Scratches, Dust, Fingerprints, and More. This case has flip capability to transform the case into a horizontal or vertical stand.Card slots, hand grip strap and wrist strap make it more convenience to use your iPad even on the go. The Case makes it ideal for watching videos, movies, typing and messaging in landscape and portrait mode on your Tablet and offers better access to the touch screen than any other case on the market. Turning your iPad off when you close the case and on when you open it and offers full in-case functionality and access to all buttons and ports including headphones, volume, mute. View More In Tripod & Monopod Cases. If you have any questions about this product by TechCode, contact us by completing and submitting the form below. If you are looking for a specif part number, please include it with your message. Photo studio boom light stand bag,50" tripod bag,canopy bag,camping bag.